Updated for Excel 2016 and based on the bestselling editions from previous versions, Microsoft Excel 2016 Programming by Example with VBA, XML and ASP is a practical, how-to book on Excel programming, suitable for readers already proficient with the Excel user interface (UI). If you are looking to automate Excel routine tasks, this book will progressively introduce you to programming concepts via numerous, illustrated, hands-on exercises. Includes a comprehensive disc with source code, supplemental files, and color screen captures (Also available from the publisher for download by writing to info@merclearning.com). More advanced topics are demonstrated via custom projects. From recording and editing a macro and writing VBA code to working with XML documents and using Classic ASP pages to access and display data on the Web, this book takes you on a programming journey that will change the way you work with Excel. The book provides information on performing automatic operations on files, folders, and other Microsoft Office applications. It also covers proper use of event procedures, testing and debugging, and guides you through programming advanced Excel features such as PivotTables, PivotCharts, and the Ribbon interface. •Contains 28 chapters loaded with illustrated "Hands-On" exercises and projects that guide you through the VBA programming language. Each example tells you exactly where to enter code, how to test it and then run it. •Includes a comprehensive disc with source code, supplemental files, and color screen captures (Also available from the publisher for download by writing to info@merclearning.com). •Takes you from introductory topics--including recording and editing macros, using variables, and constants, writing subroutines/functions, conditional statements, and various methods of coding loops to repeat actions--to intermediate and advanced topics that include working with collections, class modules, arrays, file and database access, custom forms, error handling and debugging. •Includes comprehensive coverage of native file handling in VBA, Windows Scripting Host (WSH), and low-level File Access. •Demonstrates how to interact with Microsoft Access databases using both ADO and DAO Object Libraries to access and manipulate data. •Includes chapters on programming charts, PivotTables, dialog boxes, custom forms, the Ribbon, Backstage View, context/shortcut menu customizations, as well as proper use of event procedures and callbacks. •Provides a quick Hands-On introduction to the data analysis and transformation process using the new Excel 2016 Get & Transform feature and the “M” language formulas. •Provides a practical coverage of using Web queries, HTML, XML, and VBScript in Classic ASP to retrieve and publish Excel data to the Web. "Updated for Excel 2016 this a practical, how-to book on Excel programming is suitable for readers already proficient with the Excel user interface. If you are looking to automate Excel routine tasks, this book will progressively introduce you to programming concepts via numerous, illustrated, hands-on exercises. Includes a comprehensive disc with source code, supplemental files, and color screen captures. More advanced topics are demonstrated via custom projects. 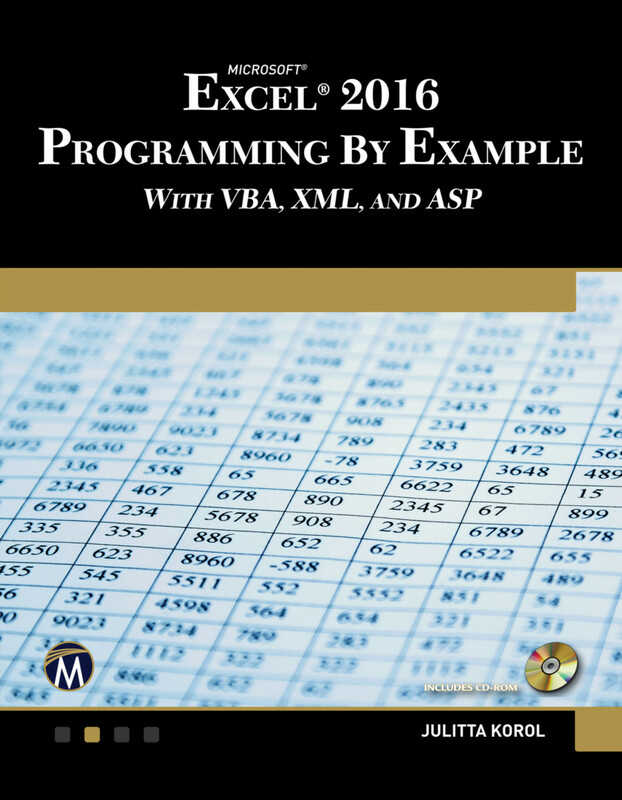 From recording and editing a macro and writing VBA code to working with XML documents and using Classic ASP pages to access and display data on the Web, this book takes you on a programming journey that will change the way you work with Excel. The book provides information on performing automatic operations on files, folders, and other Microsoft Office applications. It also covers proper use of event procedures, testing and debugging, and guides you through programming advanced Excel features such as PivotTables, PivotCharts, and the Ribbon interface."